It’s mid-June, so it must be time to write my report card for May. In May I tried to leave my iPhone and laptop at my desk a bit more and work on being truly present, especially for my kids. I still need to improve, however. If you catch me not paying 100% attention to you when I’m around you, please let me know. Status: Let’s say B- for May. I didn’t finish a damn thing in May — just a few chapters here and there. However! I did something about it: Now there’s a FriendFeed reading group, where we select a free book from the Amazon Lending Library for Kindle. (We’re reading Water for Elephants by Sara Gruen to start.) So while I failed in May, I should be back on track in June. I ran a race in May! It was the Chick Chaser 5k (suggested to me by Sparky), sponsored by the Silicon Valley Tri Club. 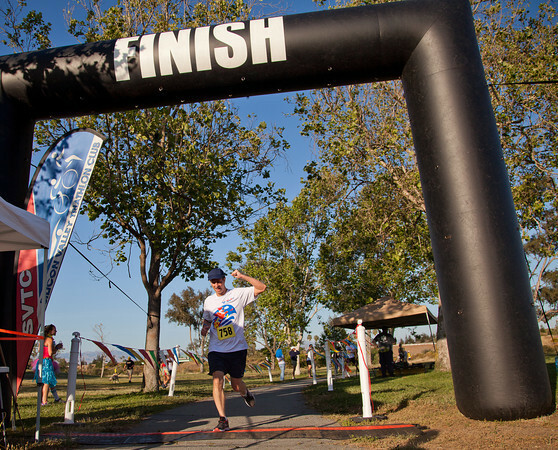 This was held in the beautiful Los Gatos Creek park, with only 35 female and 42 male runners competing (big contrast to my last two 5ks, which included thousands of runners). I was happy with my place in the results — 23rd place among the men and 29th overall, with a 7:25 pace. I started out at a faster pace than usual for me — 6:35 for the first mile — but that was in a vain attempt to keep up with all the triathletes who were zooming past me. My activity record in RunKeeper shows that after the first mile, I slowed down to about a 7:45 pace. The winners ran at a pace well under six minutes, which is intimidating to me — and it wasn’t because they’re younger. The fastest male was 47. So I can take that as inspiration that I can run faster than I do today. I still need to select a 10k to be run before September 30, and then I have a 5k in November lined up. Status: Two down, two to go! Not yet complete, but on track. Well, since I ran a race in May, I shouldn’t also have a separate RunKeeper goal for May, but I did set one for running 45 miles. I was proud of myself for my longest running distance in a month to date, 52.1 miles — beating the 50 mile mark for the first time. For June, I want to repeat that accomplishment. My RunKeeper profile shows I’m on track to run 50 miles in the month. So far in 2013 (through today), I’ve run a total of 211.1 miles. I wonder if I could hit the 500 mile mark for 2013. In May, Fitbit shows that I walked a total of 491,069 steps (up sharply from 407,972 steps in April), with an average of 15,841 steps per day (up from 13,599), a most active day of 24,112 steps, and a least active day of 10,004 steps. I did not miss my 10k step goal at all in May. I was proud to have 8 days over 20k steps (including a weekend with back-to-back 20k days), whereas in April I didn’t even have a single day above 20k steps. I had 15 runs, but just as in April, I only had 8 sessions of calisthenics and 8 sessions of weightlifting (although I did a better job of spacing them out throughout the month). Just as before, the extra runs offset the missed workouts, but I could have easily done it all. As I noted last month, I had originally set this goal to be 2 workouts per week of each type, and then switched to 9 a month, and I pointed out that that structure makes it too easy for me to slack off in the early part of the month. That’s been the case in June as well. I will need to do better at spacing out the workouts. After my dental surgery in December, the surgeon commanded me to floss twice daily. Then in April he told me it should be three times a day. So shall I do. Per Flossy, I flossed 3.2 times a day on average (between 2 and 5 times each day, with six days where I didn’t meet my goal of three times a day). I am proud of getting so much closer to hitting the goal. But I still need to buy a waterpik. I had two sugar drinks and two diet sodas in May, a bit worse than April. But it was still within the allowable limits. Not doing so well on this one — a lot of syrups and flavored lattes. To give myself something concrete to accomplish, starting in July (which is halfway through the year) I will allow myself sweeteners four days a week, on Friday, Saturday, Sunday and Monday. Mid-week coffee will be coffee and milk (and ice) only. I will phase that down to end the year with no sweeteners. Status: Incomplete, not yet on track but with a plan of attack. Still on track with this, but still need to spend more time classifying expenses and reining in spending. Zero blog posts in May not about resolutions. It should have been easy, but I didn’t do it.